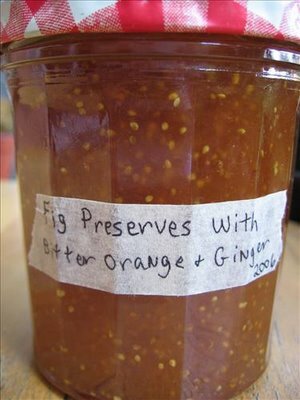 Some of the figs at the house become perfectly ripe and drip honey just before you pick them and others, especially after a rain, split open and become the ideal basis for Fig Preserves. The first time I saw the fig tree full of a chorus of open-mouthed fig sopranos, I said, “oh, we have to make preserves out of all those open figs!” And everybody looked at me like I was nuts. “Whaddya mean? Fig preserves?! That’s not a thing” was essentially the answer (well, translated from the French). It seems that in Pelion, Greece, nobody had ever heard of fig preserves. I think it goes back to how in Mediterranean areas, fig trees are tantamount to weeds. Maybe they don’t get the respect they deserve. Long story short, I insisted in making them and now they are a family favorite along with the traditional bitter orange marmalade, golden plum and blackberry preserves. Either cut the figs into small pieces (how small depends on what kind of texture you like in your preserves) or puree them with **an immersion blender. In your largest stock pot place 4-5 clean empty glass jars (recycled jars with screw-tops will do just fine), cover with water and put over high heat. It usually takes a long time to get such a large volume of water to boil, so put the jars on the stove before the jam. Put the figs into a large heavy-bottomed pot, add the sugar, ginger, zest and juice and mix until all the sugar is incorporated and you have a wet, sticky consistency. Put the heat on high until you reach a boil. There will be foam but you do not have to ***skim it off the top. Music to boil jam by: My favorite old school rap song, "Jam On It" by Newcleus. Watch the video here. After the foam subsides, you can begin to check for doneness. It may take another 15 minutes after the foam subsides for the preserves to be thick enough. Each jam is different so exact times are hard to give. There are many done-ness tests to do and one I learned from Valeria and feel works well is to take a cool, dry saucer and let a drop of the preserves fall on it. If it remains dome-like and doesn’t spread at all, your preserves are fully cooked and will spread well on toast. If they are too runny, they work well as an ice cream topping or you can re-cook them. Once your preserves are thick enough and your jars and lids are at a rolling boil, you’re ready to jar the preserves. Utensils you will need: 1 long wooden spoon, 1 ladle, 1 plastic funnel cut in half so that the pouring space is narrower than the jar mouths but wide enough for the preserves to go through, 2 oven mitts and ideally 1 friend standing by, surgical technician-like, to make the process go more smoothly. Using the long, wooden spoon, fish out one of the jars and shake it upside down to remove excess water (the spoon should be inside the upside-down jar). Place the jar right-side-up next to the pot of preserves. Place the funnel over the jar, ladle in jam up to just millimeters from the very top, fish out a lid with the spoon and, using oven mitts, screw the lid on very tightly. Flip the sealed jar upside-down on the counter and proceed with the subsequent jars. Allow to cool completely. There are often some extra preserves that won’t fit into the jars and that can be ladled into a cup and eaten with toast the next morning. *Since figs are sweet, sweet, sweet, I find that they go well with a little less sugar than normal (usually the jam-making ratio of fruit to sugar is 1 to 1) and with astringent flavors like ginger and citrus zest to create a zingy-sweet balance. **This year I learned that before cooking, taking an immersion blender to the peeled green (or unpeeled purple) figs gives you a smooth consistency while leaving the little, crunchy seeds intact. okay, i'm about to cry. figs, fig preserves, what next? a fig festival?? i want a fig so bad. Hi Melissa, I've got dried figs. They're not that impressive, though. Wow, this sounds easy enough that I could probably do it without losing too many fingers... I may have to try this. There's a Mediterranian market near me that sells figs. And the best part: Music to boil jam by... LOL!!! I think you have the makings of the next unique Food Network program: Music and food, cooking and "cookin'!" Hey MOTS, Glad to hear from you. I always got my figs in Chicago at Caputo's. When you buy a pint, make sure the figs are ugly. Split, mushy, you know. If they're too nice-looking, they won't have much flavor. Oh, and if you're looking for a music-cuisine connection, check out Post-Punk Kitchen with Isa Chandra. It's great but sadly, all the food is vegan. Eeesh. Hi Ellie, that's right. Figs are much like zucchini, they just explode for 1 month and then there are none left. And there's nothing like waking up on a cold winter morning and making toast with you own summer jam. It actually makes me feel warmer! can i give you my mailng address? Hey Tracie, Careful, if you do, you might find me camping out in Ischia with you! Ok! E-mail me your address (at camp0189@umn.edu) and I'll send you a jar; but be careful, I might forego le Poste Italiane and bring it myself! Ischia, isn't it?